The Kentucky River was once fully navigable from the Ohio River at Carrollton to Beattyville, Kentucky. Fourteen locks and dams provided safe passage for passengers and freight alike. Today, only the first four locks to Frankfort are in operation while the remainder has been abandoned or sealed to prevent traffic. Before the dawn of the automobile and the first-rate railroad, the Kentucky River was the primary route of access to locations in central Kentucky. At one point, the river was fully navigable from the Ohio River at Carrollton to Beattyville, with fourteen locks and dams providing safe passage for passengers and freight alike. 1 In 1986, the Kentucky River Authority was established by the Kentucky General Assembly 2 to take over operation of Lock & Dam No. 5 through No. 14 from the United States Corps of Engineers; they were subsequently closed and sealed with concrete barriers. Only the first four locks from Carrollton to Frankfort remain in operation. Lock and Dam No. 2 is located in Lockport, 31 miles south of the mouth of the Ohio River, and supports an 11-mile long pool of water. 4 It was built in 1836-42 as a timber crib strucwhich consistedsisted of an outside frame of timbers filled with dirt and rock with a lock built of stone masonry. It was rebuilt in 1882 by the Army Corps of Engineers. 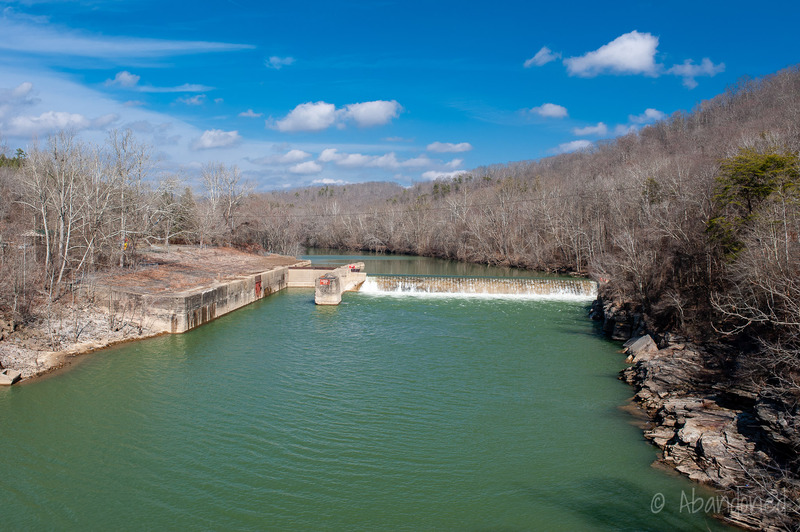 In the early 1890’s, a concrete cap was added to the top of the timber crib dam. In 1950, the wood lock gates were replaced with steel gates, with repairs to the upper guide wall and guide wall in 1977. Additional repairs and the installation of sheet piling in front of the dam was finished in 1980. 4 The lock was closed due to structural and mechanical problems in 2007 and later repaired. Lock and Dam No. 3 is located in Gest, 42 miles south of the mouth of the Ohio River, and supports a 23-mile long pool of water. 7 It was built in 1836-42 as a timber crib structure, which consisted of an outside frame of timbers filled with dirt and rock with a lock built of stone masonry. It was rebuilt in 1882 by the Army Corps of Engineers. A concrete overlay of the top of the timber crib dam was completed in the early 1890’s, and an additional overlay was completed on approximately two-thirds of the dam by 1911. 7 A concrete wall was added adjacent to the abutment opposite of the lock, running upstream for 70 feet, in 1908. Repairs to cracks and holes in the concrete cap were completed in 1941. 7 New concrete was poured to the crest of the dam and sheet piling was added to the front of the dam for additional stability in 1977. The abutment, opposite of the lock, was repaired with rock armoring in 2005. Despite this, the lock was closed in 2007 due to structural and mechanical problems. Lock and Dam No. 6 is located in Oregon, 96 miles south of the mouth of the Ohio River, and supports a 21-mile long pool of water. 3 It was built from 1888-91 as a timber crib structure, which consisted of an outside frame of timbers filled with dirt and rock with a lock built of stone masonry. A Concrete overlay of the timber crib was completed in 1911. In 1966, steel sheet pilings were driven upstream of the dam, and the upper slope was leveled off with new concrete. 3 In 1983, repairs were completed when 22,000 tons of derrick stone were installed to help fill voids in the dam and to protect the far abutment. Eleven years later, the river guide wall was removed, and the downstream face voids were filled with a new concrete overlay. Derrick stone was placed below the dam. Lock and Dam No. 7 is located in High Bridge, 117 miles south of the mouth of the Ohio River, and supports a 23-mile long pool of water. 5 It was built in 1896-97 as a timber crib structure which consisted of an outside frame of timbers filled with dirt and rock with a lock built of stone masonry. A concrete overlay of the timber crib was completed in 1914. Work in 1994 and 1995 removed the river guide wall, and downstream face voids were filled with a new concrete overlay with derrick stone being placed below the dam. Lock & Dam No. 8 is located near Camp Nelson and was constructed from 1898 to 1900. 5 The dam supports a 17½-mile long pool of water and is located 140 miles from the mouth of the Ohio River. Constructed originally of a timber crib structure, which consisted of an outside frame of timbers filled with dirt and rock with a lock built of stone masonry. Work from 1993 to 1995 removed the river guide wall, and downstream face voids were filled with a new concrete overlay with derrick stone being placed below the dam. In 2001, a cutoff wall was placed inside the lock, rendering it inoperable. 5 Grout bags were placed along the far abutment to stop leakage in 2002. Lock and Dam No. 7 is located in Heidelberg, 249 miles south of the mouth of the Ohio River. 9 It was built in 1911-17 as a concrete structure. In 1999, sheet piling backfilled with gravel was placed across the main dam and capped with concrete. 9 The abutments were rebuilt with new release valves, and derrick stone was placed below the dam. A concrete cutoff wall was built in the lock chamber, and the lock filling valves were sealed, rendering the lock system inoperable. Kentucky River Lock & Dam No. 14 is located at Heidelberg, Kentucky. Jenior, Pete. “Kentucky River Lock and Dam Guide.” March 9, 2007. “Kentucky River Authority.” Kentucky Finance Cabinet. March 9, 2007. “Lock and Dam 6.” Finance and Administration Cabinet. Commonwealth of Kentucky, 13 Mar. 2008. Web. 6 Mar. 2012. “Lock and Dam 2.” Finance and Administration Cabinet. Commonwealth of Kentucky, 13 Mar. 2008. Web. 6 Mar. 2012. “Lock and Dam 7.” Finance and Administration Cabinet. Commonwealth of Kentucky, 13 Mar. 2008. Web. 6 Mar. 2012. “Lock and Dam 8.” Finance and Administration Cabinet. Commonwealth of Kentucky, 13 Mar. 2008. Web. 6 Mar. 2012. “Lock and Dam 3.” Finance and Administration Cabinet. Commonwealth of Kentucky, 13 Mar. 2008. “Kentucky River Lock and Dam 1, 3 and 4.” Brayman Construction. Article. “Lock and Dam 14.” Finance and Administration Cabinet. Commonwealth of Kentucky.